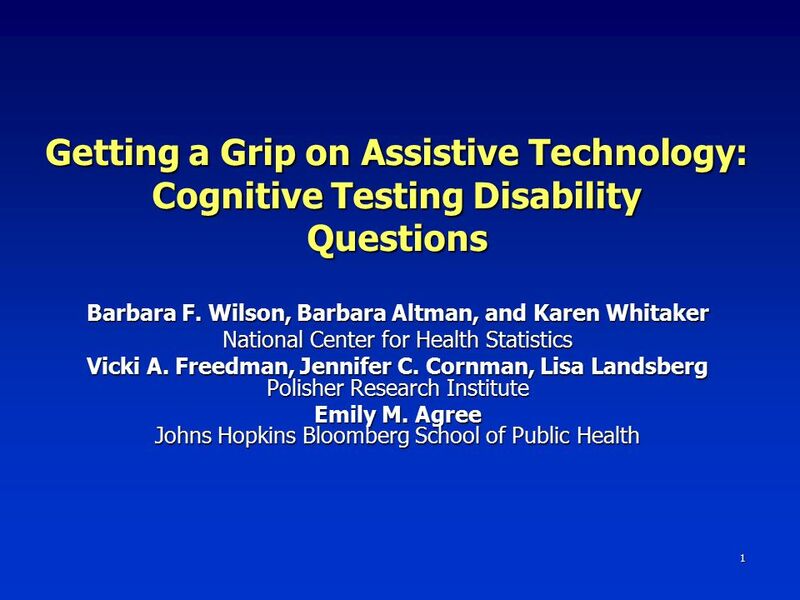 1 Getting a Grip on Assistive Technology: Cognitive Testing Disability Questions Barbara F. Wilson, Barbara Altman, and Karen Whitaker National Center. 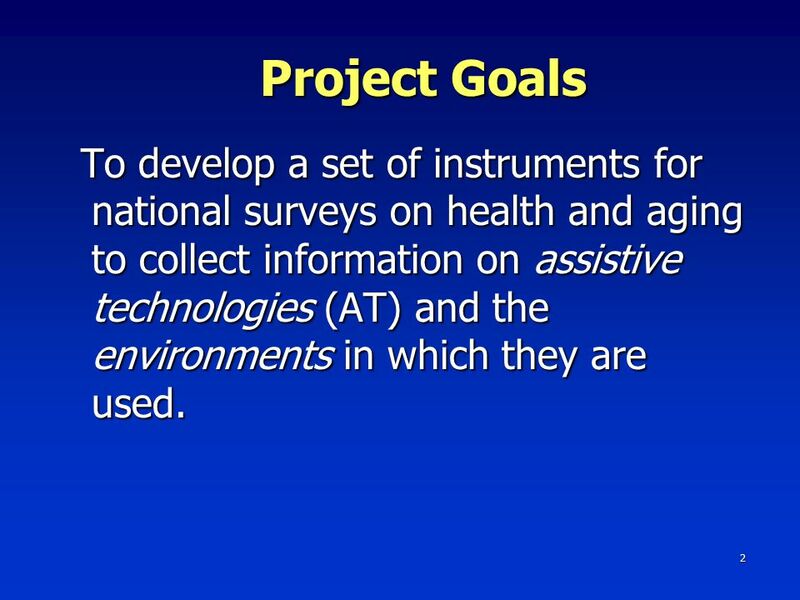 2 2 Project Goals To develop a set of instruments for national surveys on health and aging to collect information on assistive technologies (AT) and the environments in which they are used. 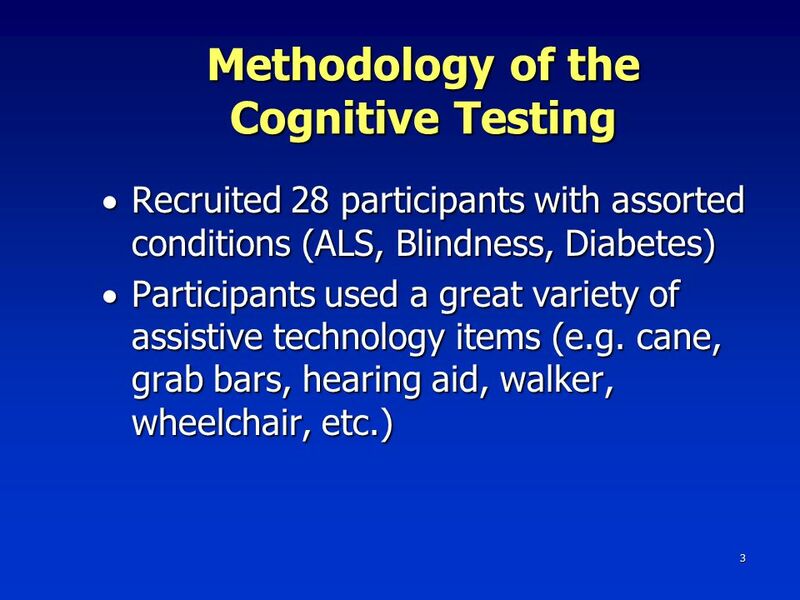 To develop a set of instruments for national surveys on health and aging to collect information on assistive technologies (AT) and the environments in which they are used. 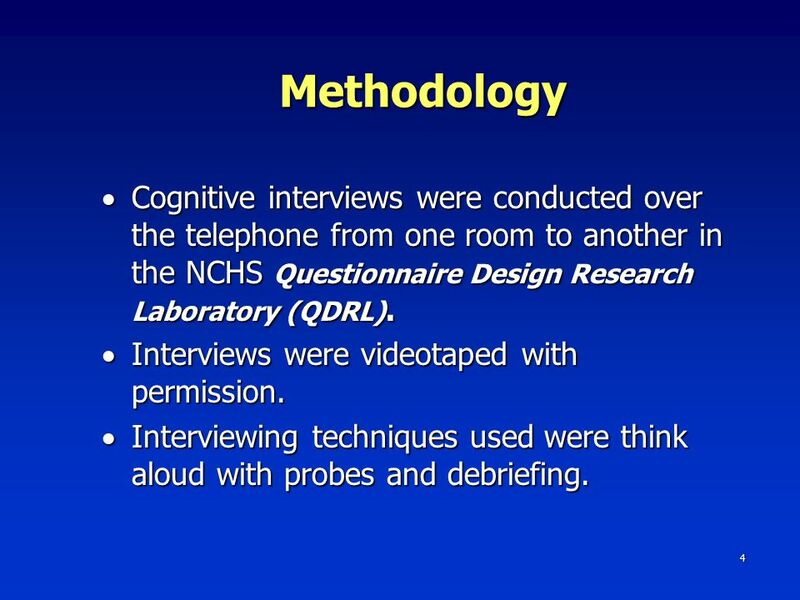 4 4 Methodology  Cognitive interviews were conducted over the telephone from one room to another in the NCHS Questionnaire Design Research Laboratory (QDRL).  Interviews were videotaped with permission. 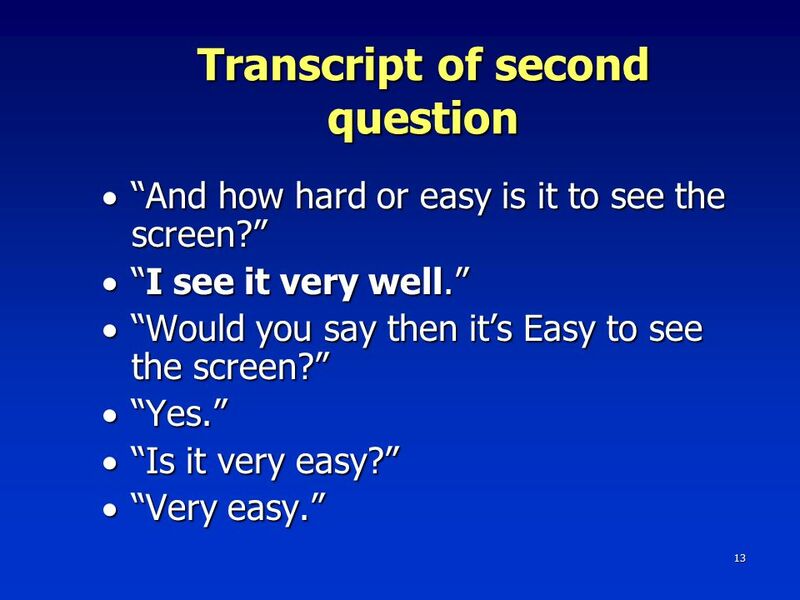  Interviewing techniques used were think aloud with probes and debriefing. 5 5 Methodology  Three rounds of testing. 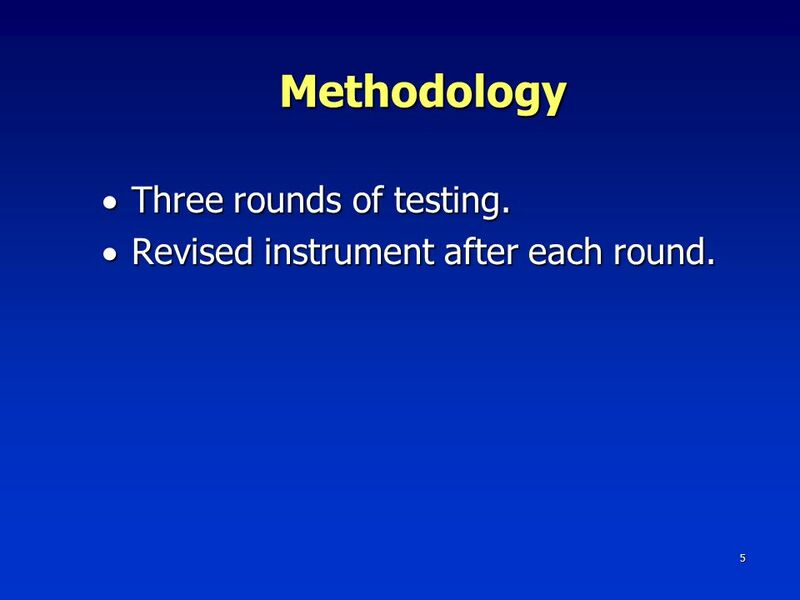  Revised instrument after each round. 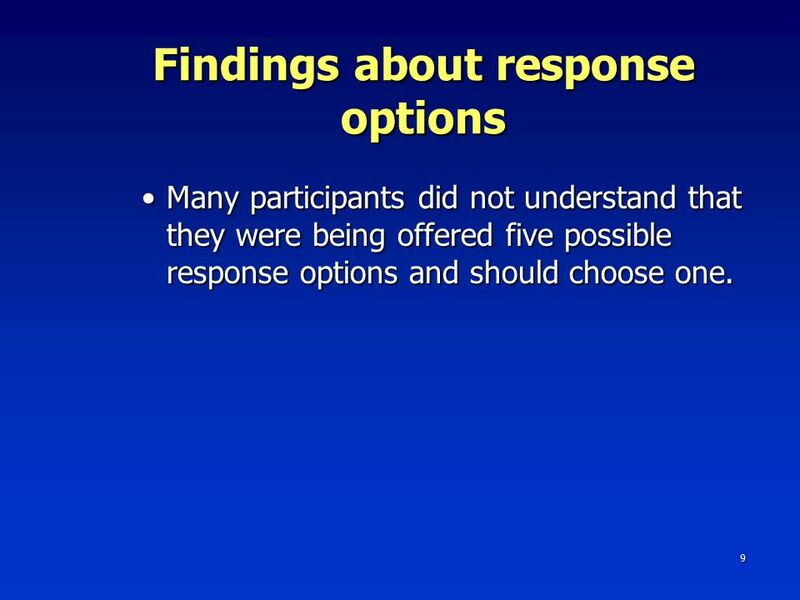 9 9 Findings about response options Many participants did not understand that they were being offered five possible response options and should choose one.Many participants did not understand that they were being offered five possible response options and should choose one. 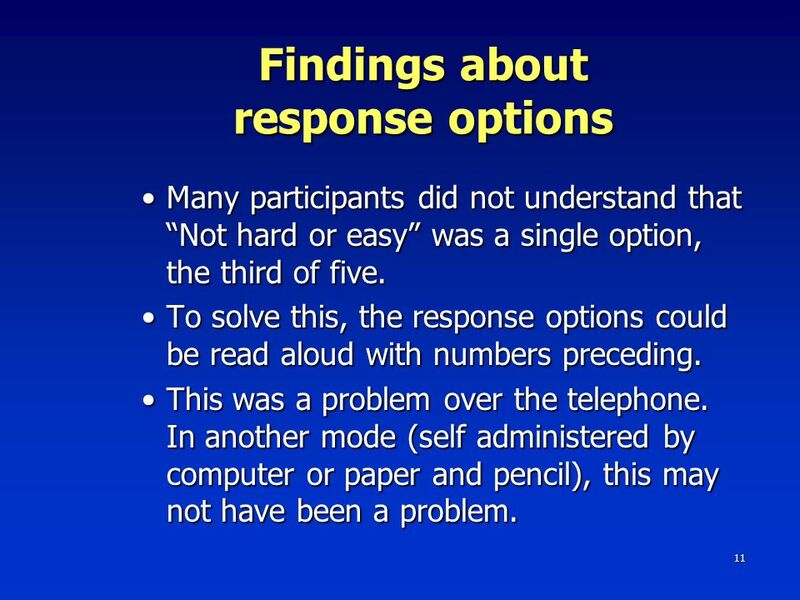 11 11 Findings about response options Many participants did not understand that “Not hard or easy” was a single option, the third of five.Many participants did not understand that “Not hard or easy” was a single option, the third of five. 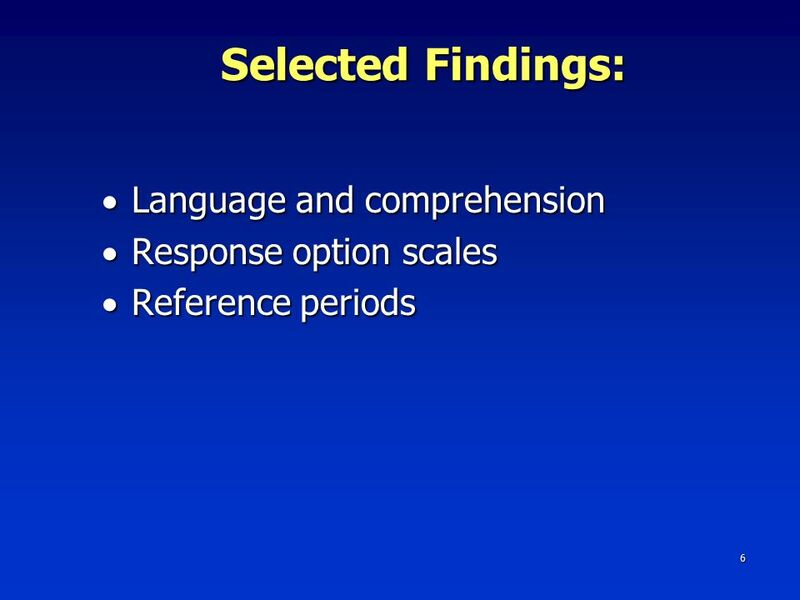 To solve this, the response options could be read aloud with numbers preceding.To solve this, the response options could be read aloud with numbers preceding. This was a problem over the telephone. In another mode (self administered by computer or paper and pencil), this may not have been a problem.This was a problem over the telephone. In another mode (self administered by computer or paper and pencil), this may not have been a problem. 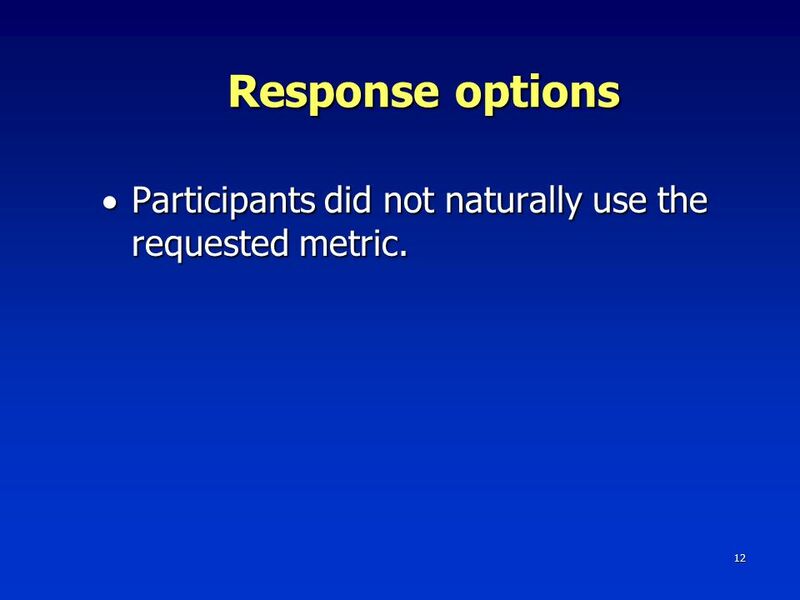 12 12 Response options  Participants did not naturally use the requested metric. 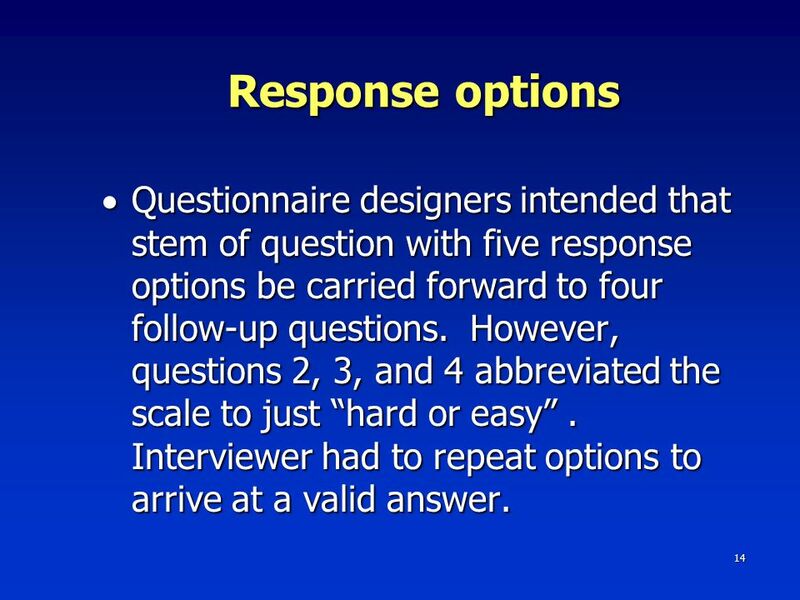 14 14 Response options  Questionnaire designers intended that stem of question with five response options be carried forward to four follow-up questions. 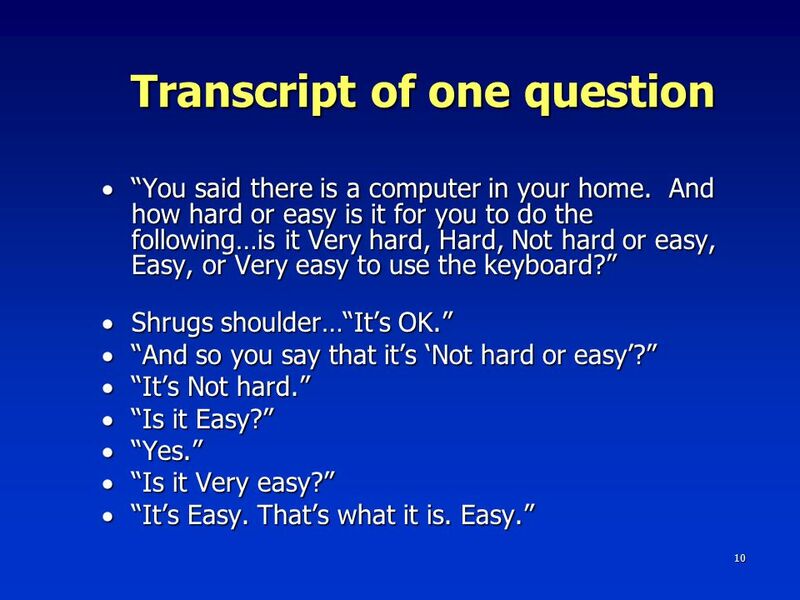 However, questions 2, 3, and 4 abbreviated the scale to just “hard or easy”. 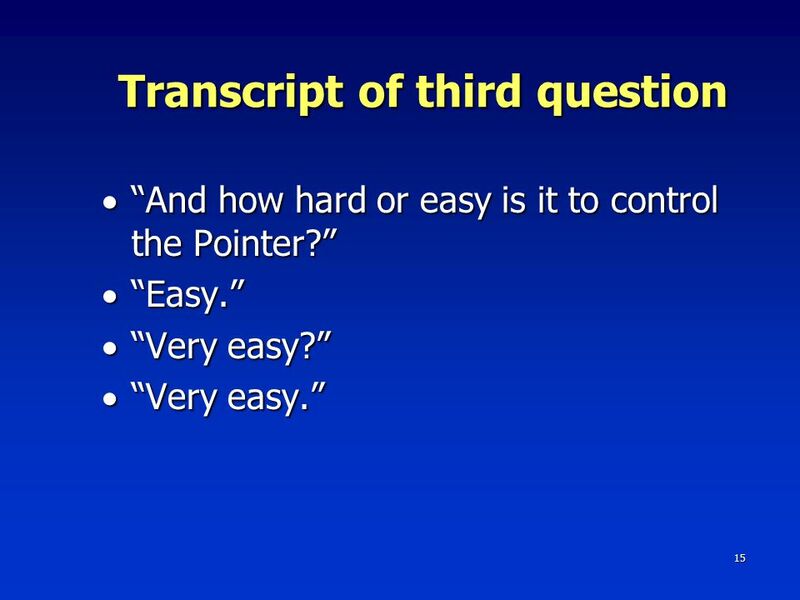 Interviewer had to repeat options to arrive at a valid answer. 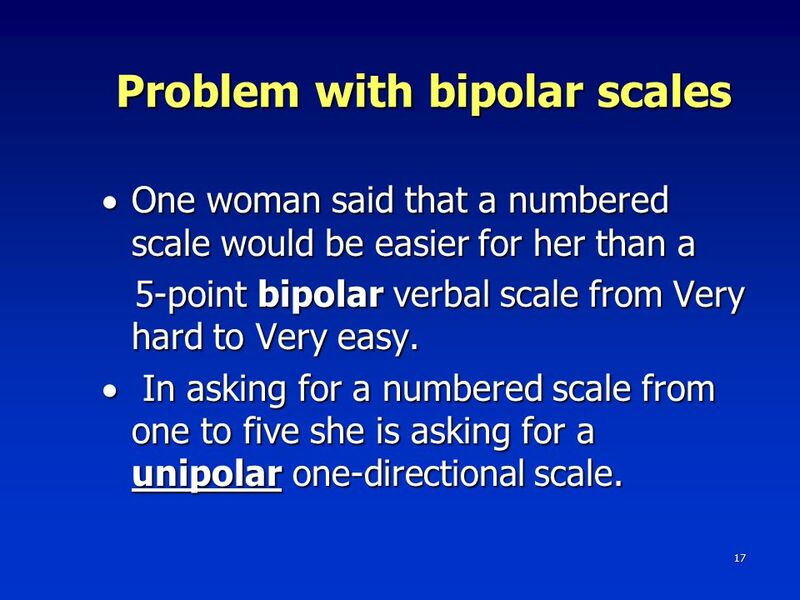 17 17 Problem with bipolar scales  One woman said that a numbered scale would be easier for her than a 5-point bipolar verbal scale from Very hard to Very easy. 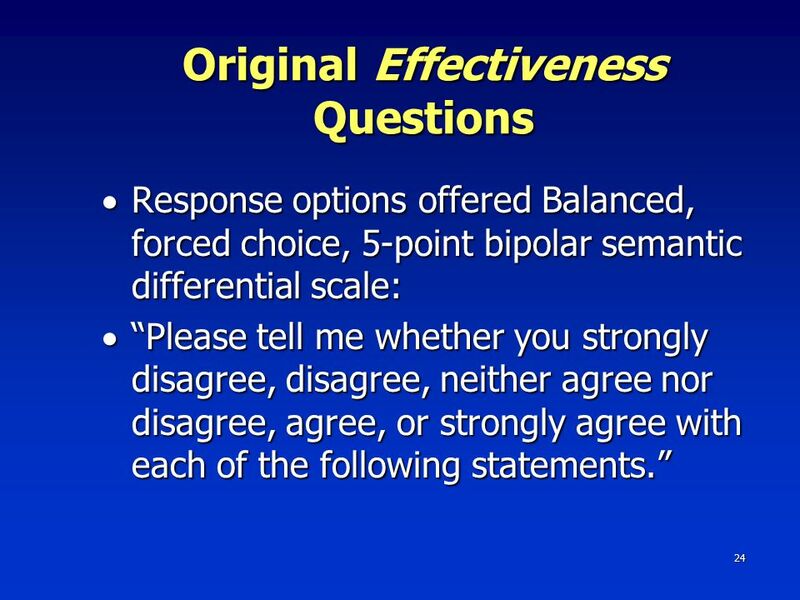 5-point bipolar verbal scale from Very hard to Very easy.  In asking for a numbered scale from one to five she is asking for a unipolar one-directional scale. 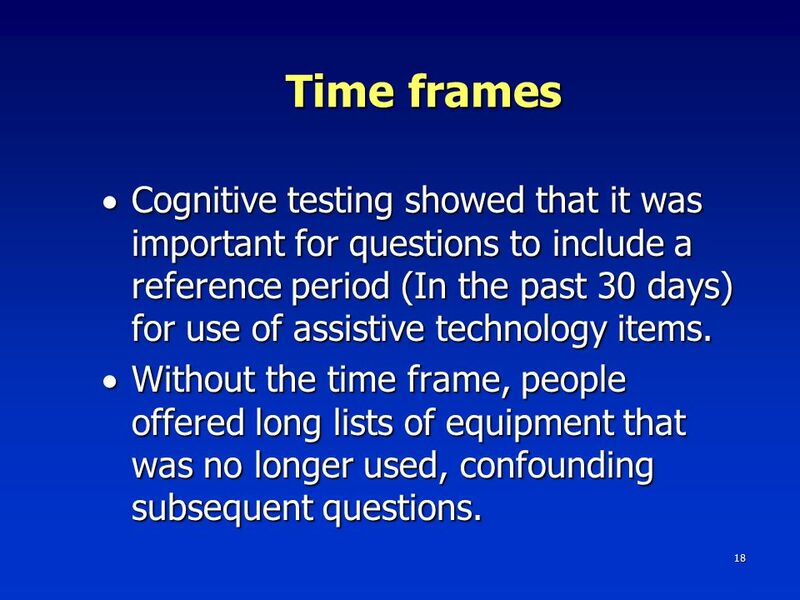 18 18 Time frames  Cognitive testing showed that it was important for questions to include a reference period (In the past 30 days) for use of assistive technology items.  Without the time frame, people offered long lists of equipment that was no longer used, confounding subsequent questions. 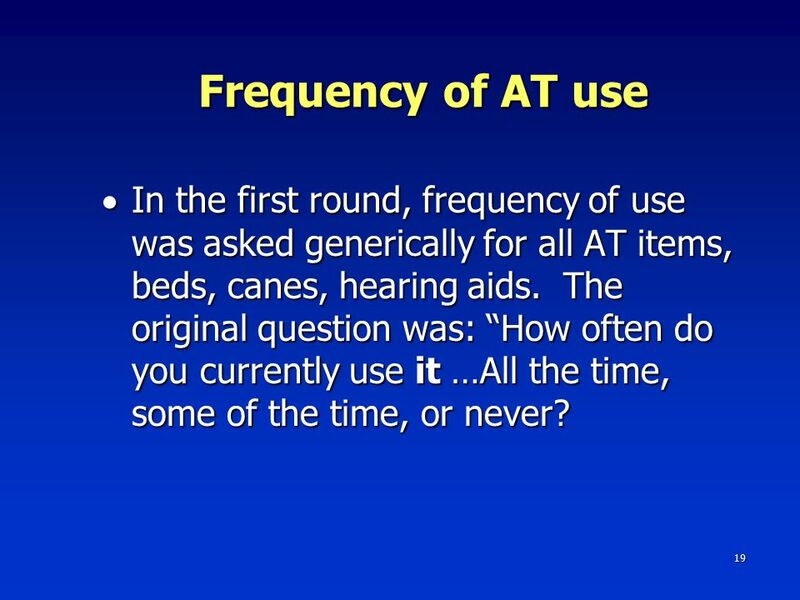 19 19 Frequency of AT use  In the first round, frequency of use was asked generically for all AT items, beds, canes, hearing aids. 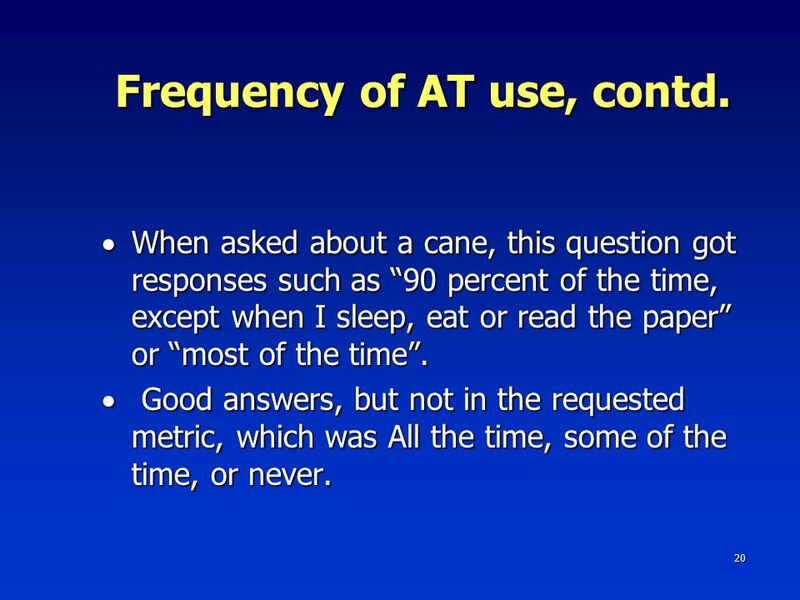 The original question was: “How often do you currently use it …All the time, some of the time, or never? 20 20 Frequency of AT use, contd.  When asked about a cane, this question got responses such as “90 percent of the time, except when I sleep, eat or read the paper” or “most of the time”. 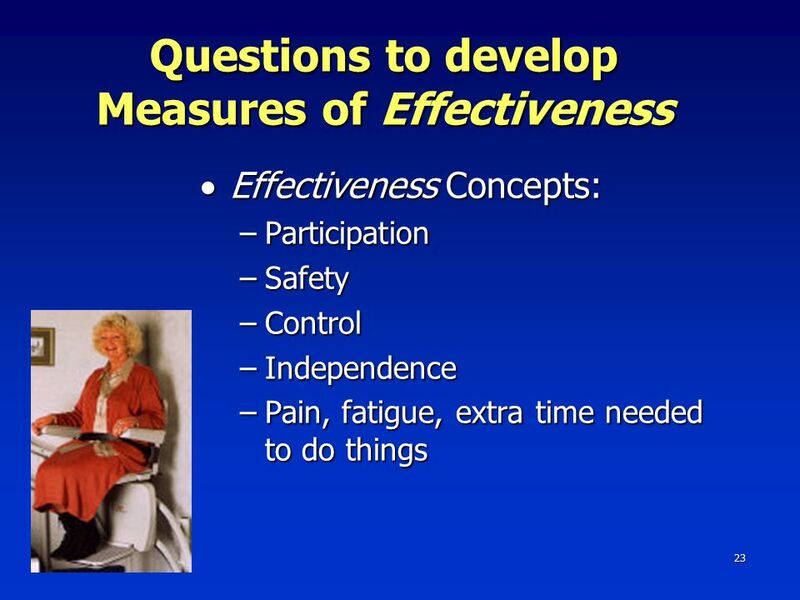  Good answers, but not in the requested metric, which was All the time, some of the time, or never. 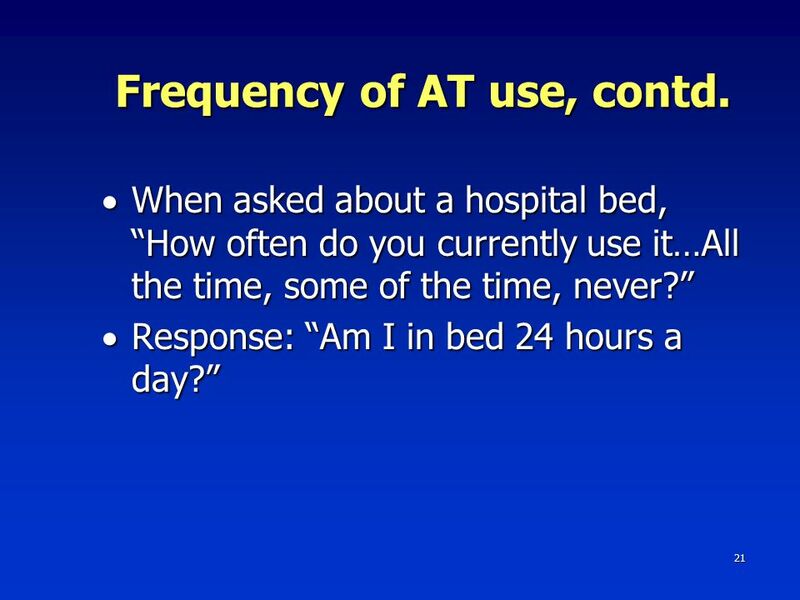 22 22 Frequency of AT use, contd. 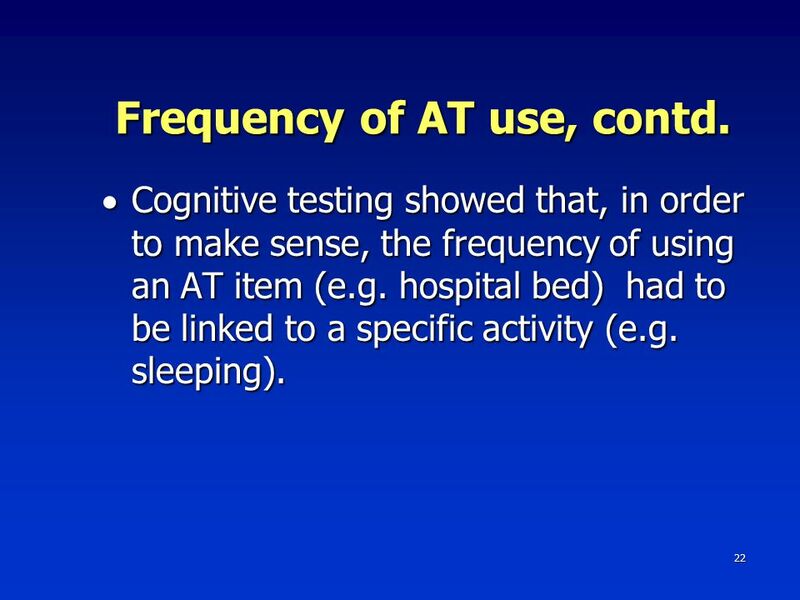  Cognitive testing showed that, in order to make sense, the frequency of using an AT item (e.g. hospital bed) had to be linked to a specific activity (e.g. sleeping). 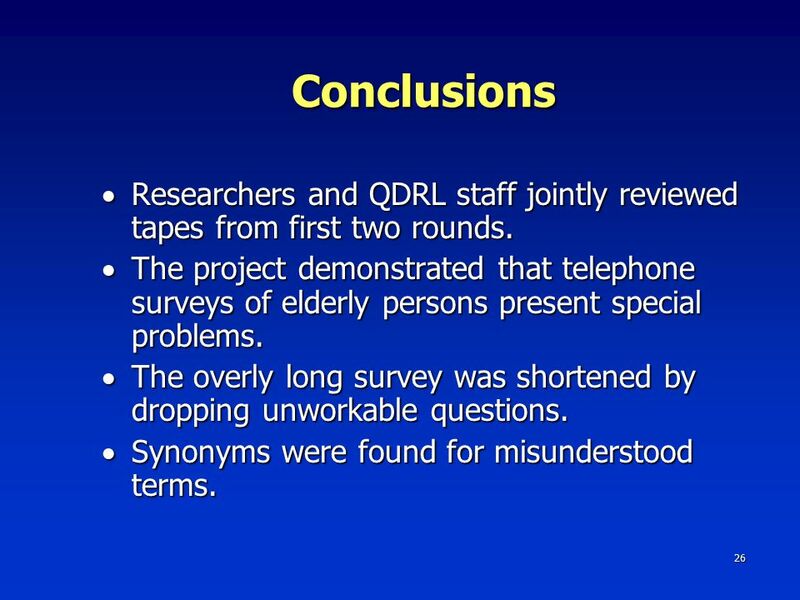 26 26 Conclusions  Researchers and QDRL staff jointly reviewed tapes from first two rounds.  The project demonstrated that telephone surveys of elderly persons present special problems.  The overly long survey was shortened by dropping unworkable questions.  Synonyms were found for misunderstood terms. 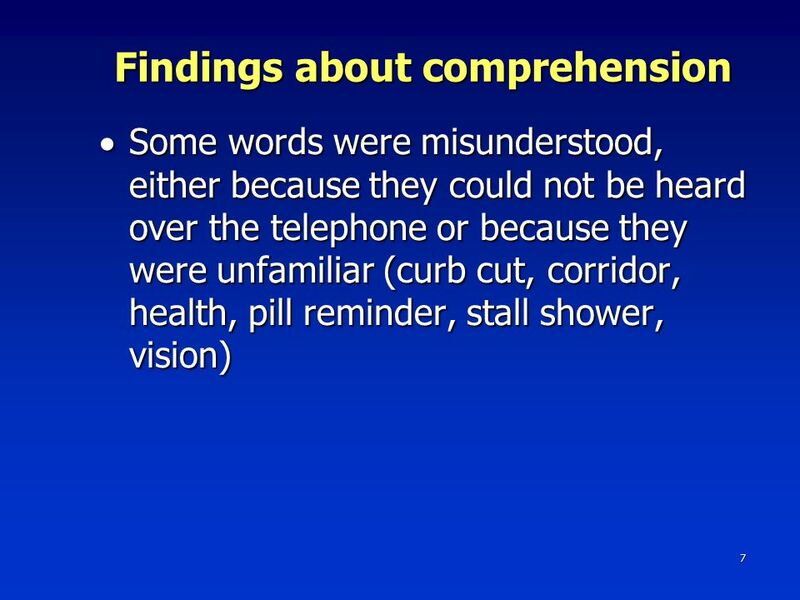 27 27 Conclusions, contd.  Purpose of confusing questions was clarified. 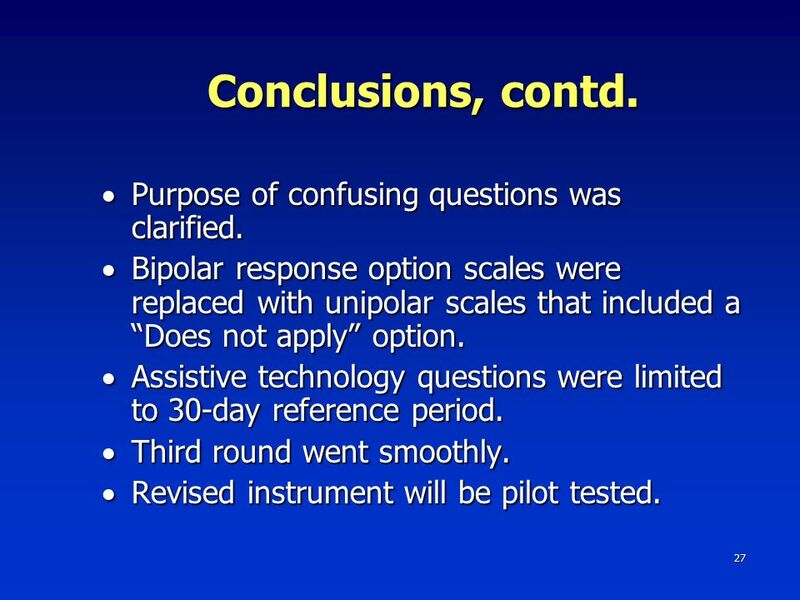  Bipolar response option scales were replaced with unipolar scales that included a “Does not apply” option. 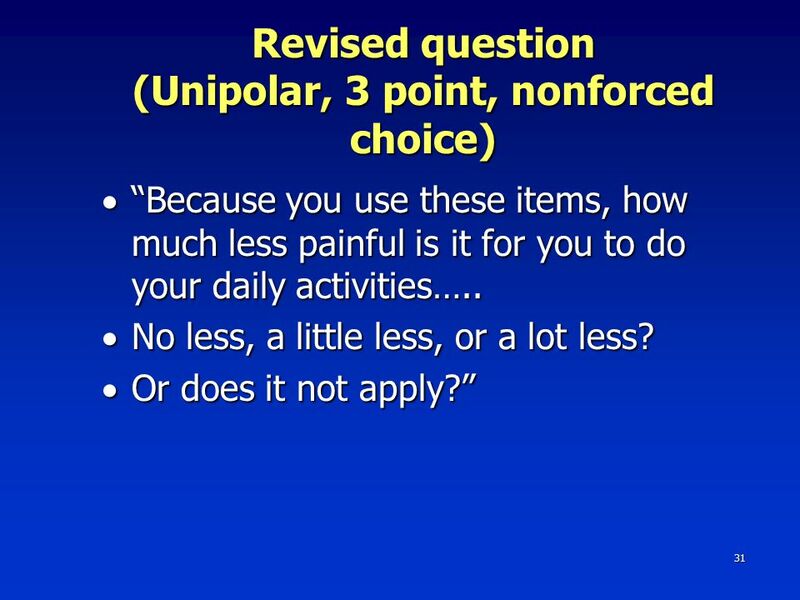  Assistive technology questions were limited to 30-day reference period.  Third round went smoothly.  Revised instrument will be pilot tested. 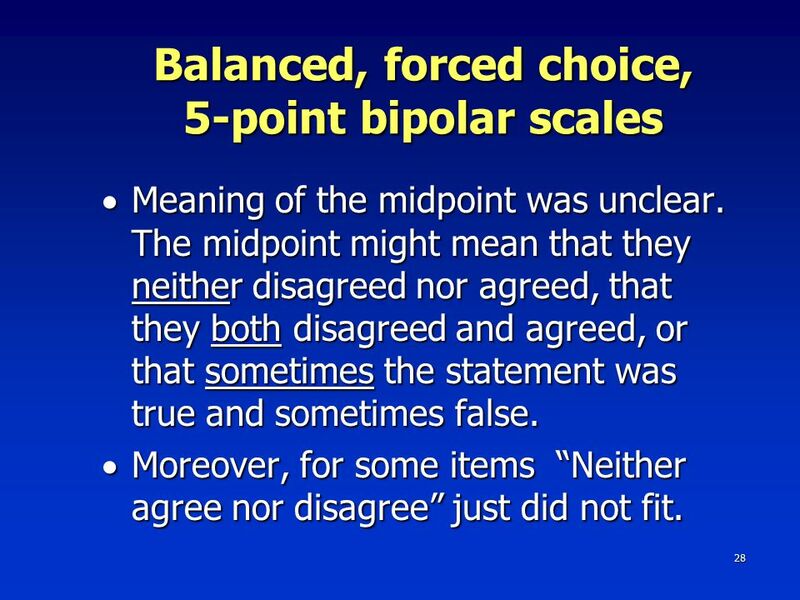 28 28 Balanced, forced choice, 5-point bipolar scales  Meaning of the midpoint was unclear. The midpoint might mean that they neither disagreed nor agreed, that they both disagreed and agreed, or that sometimes the statement was true and sometimes false.  Moreover, for some items “Neither agree nor disagree” just did not fit. 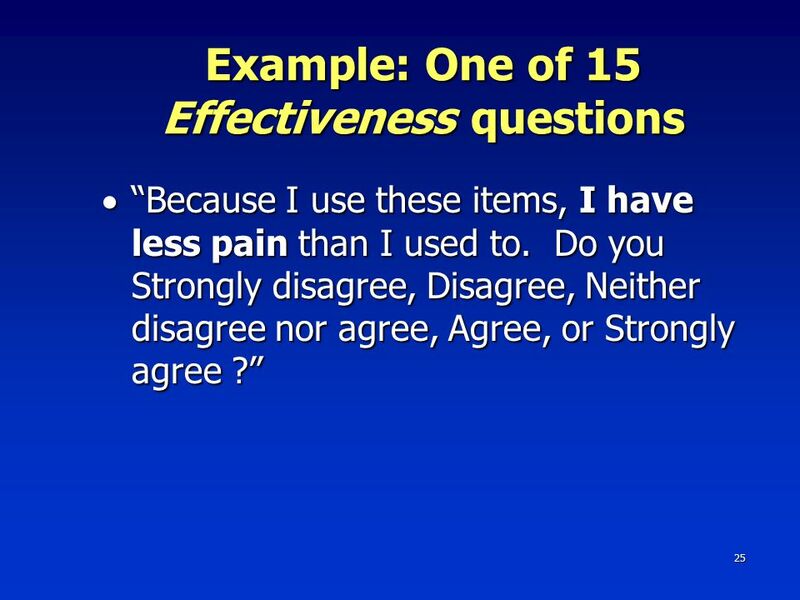 29 29 Example  “I have less pain than I used to.”  One participant said she never had pain. 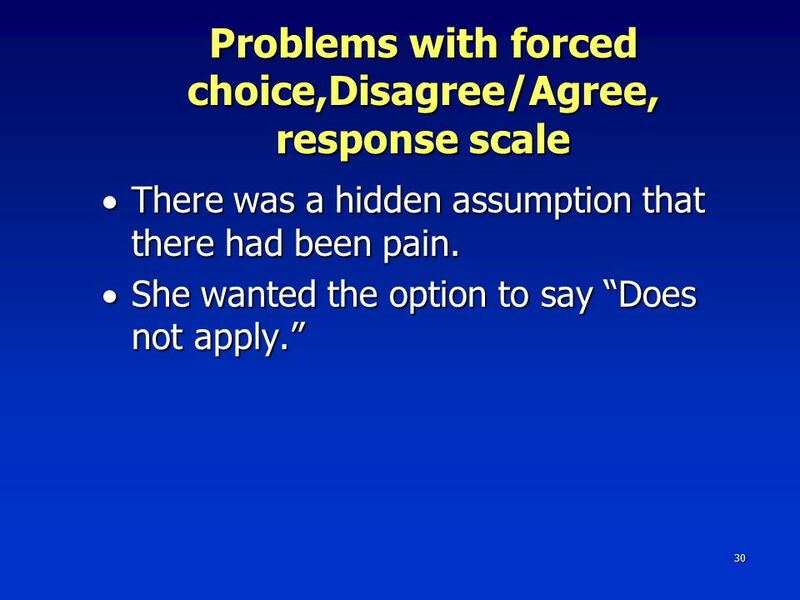 If she agreed that she had less, then it would seem as if she previously had pain. 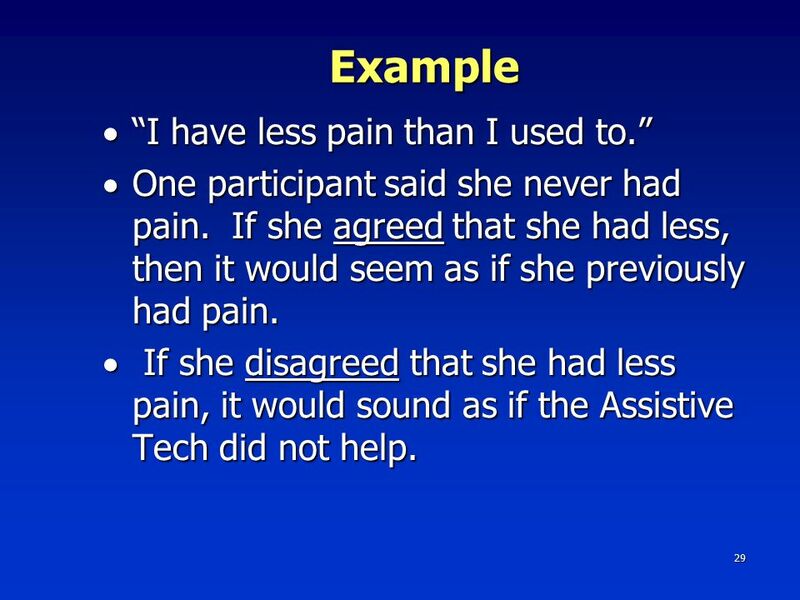  If she disagreed that she had less pain, it would sound as if the Assistive Tech did not help. 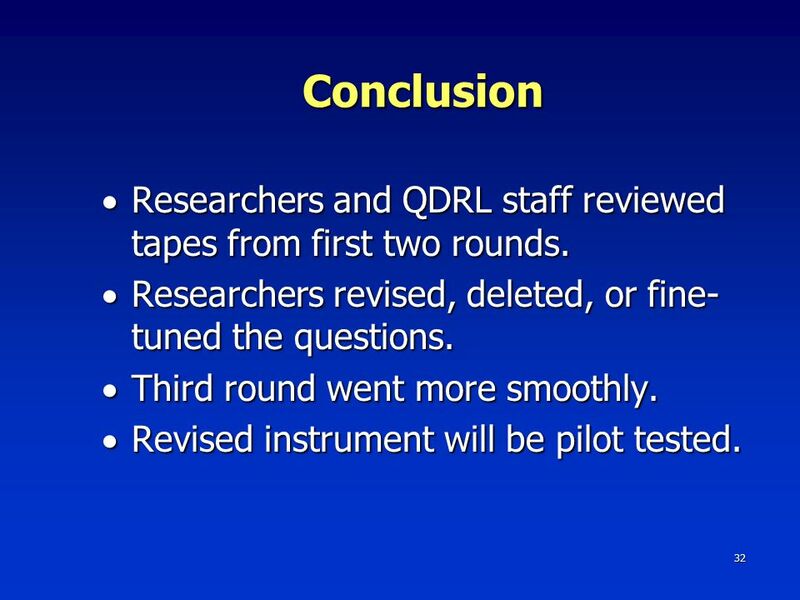 32 32 Conclusion  Researchers and QDRL staff reviewed tapes from first two rounds. 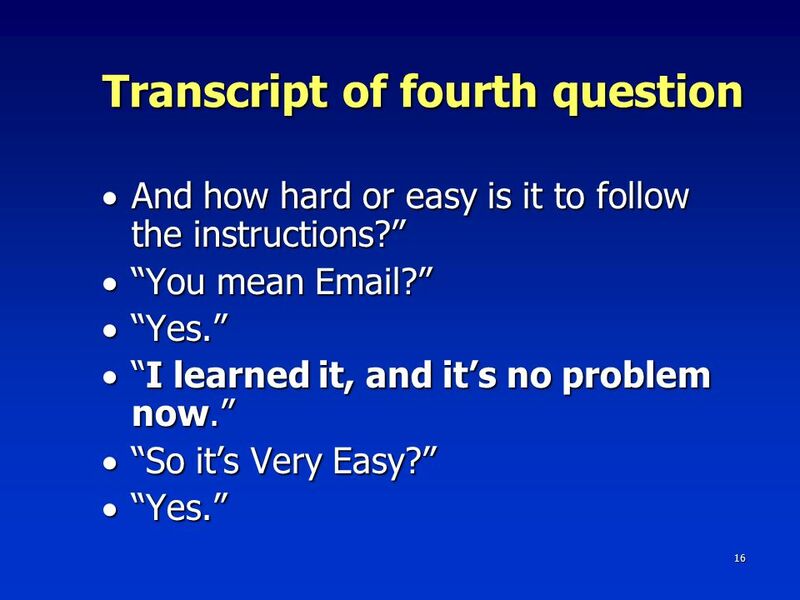  Researchers revised, deleted, or fine- tuned the questions.  Third round went more smoothly.  Revised instrument will be pilot tested. 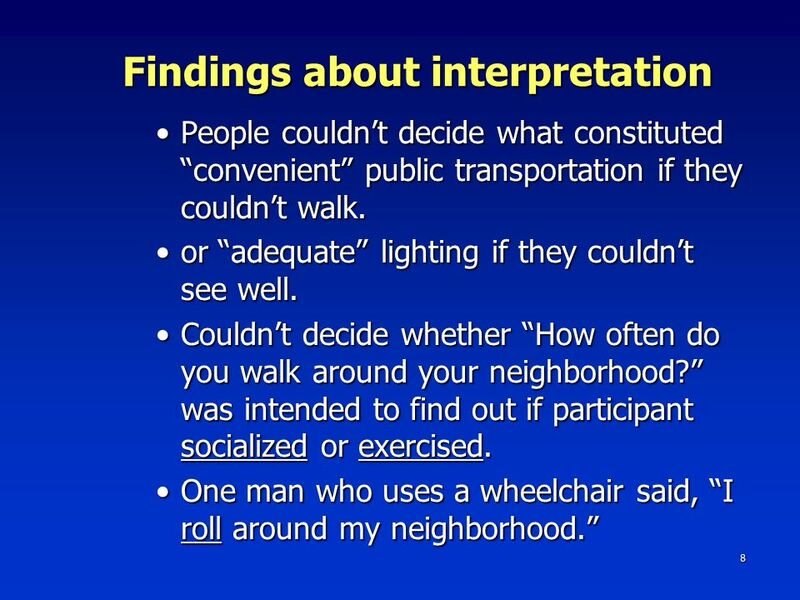 Download ppt "1 Getting a Grip on Assistive Technology: Cognitive Testing Disability Questions Barbara F. Wilson, Barbara Altman, and Karen Whitaker National Center." 单句改错专练500题 1. Everyone of us is working hard in the factory. Copyright © 2003 Pearson Education, Inc. Slide 1 Computer Systems Organization & Architecture Chapters 8-12 John D. Carpinelli. 1 Copyright © 2013 Elsevier Inc. All rights reserved. Appendix 01. My Alphabet Book abcdefghijklm nopqrstuvwxyz. FACTORING ax2 + bx + c Think “unfoil” Work down, Show all steps. 1 Discreteness and the Welfare Cost of Labour Supply Tax Distortions Keshab Bhattarai University of Hull and John Whalley Universities of Warwick and Western. REVIEW: Arthropod ID. 1. Name the subphylum. 2. Name the subphylum. 3. Name the order.